You may want to discuss with your students the role of variation in nature. The precipitation on Sta. Cruz Island varies very significantly from month to month throughout the year -- and from year to year. This panorama was created well within the "arid zone" of the island -- but after an extremely wet February. If you were to visit this site later in the year (perhaps in July or August) it would typically be much drier; similarly, if you were to visit the site several years on March 13th, the day this panorama was created, some years would be much less lush than others. How does such a variable environment affect the evolution and functioning of the plants that live here? Most of the lowland areas in the Galápagos Islands, such as this site, are considered to be in the Arid Zone. 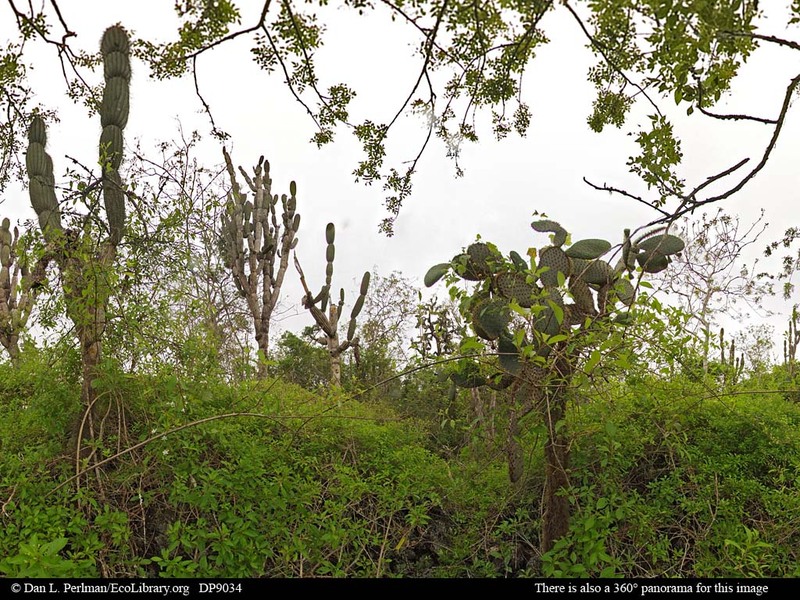 These areas are frequently dominated by the taller species seen here: large cacti (the flat-padded prickly pear or Opuntia and the tall, thin candelabra or Jasminocereus) and gray-barked palo santo trees, Bursera graveolens. For a location in the "Arid Zone," however, this site looks remarkably lush. This image was taken at the end of the rainy season during a year with a strong El Niño event, which made it much wetter than usual and the vegetation responded vigorously. Compare this panorama with the Mangrove and Scalesia forest panoramas from the same island.